I decided I would try to post reviews for the books that I read during the Fall Into Reading Challenge 2009. The challenge is open to everyone, whether you plan on reading two books or thirty-two, it's totally up to you. Feel free to check out my list if you would like. Reviews are not officially part of the challenge, I just thought it would help me keep track of my thoughts and might also be of interest to fellow readers out in Blogland. Huge emphasis on might, by the way. Unless you recently crawled out from under a rock, you have probably heard of Dan Brown, the author of The DaVinci Code among others. His books seem to generate a lot of discussion between those that love him and those that, well, don't. 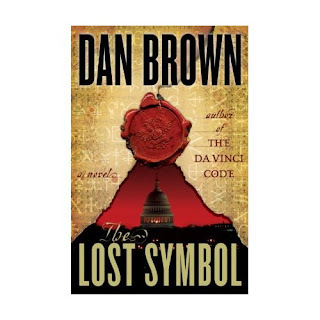 I had not read any of his previous books, but decided to give The Lost Symbol a chance since it is set in and around Washington D.C. The story revolves around the efforts of Robert Langdon, a well known cryptographer, to solve a puzzle of codes and symbols, in less than 24 hours, in order to save his friend's life. The clues lead him to several well known Washington DC landmarks and along the way he discovers more about the Masons and their imprint on our nation's capital. I liked reading about the history of many well known monuments and buildings. I don't know if the Society of Freemasons has as much far reaching impact as the author suggests, but it was interesting to learn more about them. To me, some parts of the book were bogged down with too many detailed science and new-age descriptions, which were often repetitive. The story kept me mostly engaged, although certain parts were implausible and quite predictable. I would rate it 2.5 stars and recommend it for those seeking a quick, semi-thriller read. Perfect for light airplane reading. Sarah's Key is a short, sensitive novel that sheds light on another aspect of the Holocaust. The story is told from Sarah's perspective, a child in Paris, France in 1942 and Julia's, a journalist living in Paris in 2002, researching the arrest and eventual transport to Auschwitz of thousands of Jewish French citizens (mainly women and children), not by Germans, but by French police. I did not know anything about the incident at Vel' d'Viv' and was moved by the story. Even though WWII and the Holocaust are disturbing episodes in our history, I find myself drawn to novels about that time period. I rate Sarah's Key 3 stars. If you like historical mystery novels I would highly recommend the Amelia Peabody series by Elizabeth Peters. I recently finished the second book in the series, The Curse of the Pharaohs. They are clean, witty and the archaeological details are interesting to read. I enjoyed the first one, Crocodile on the Sandbank a little more than the second, but still found it entertaining. What are you reading right now? Do you think you'll do the Fall Into Reading Challenge? Jump on in, it'll be fun. In honor of our trip to Boston, I am (finally) reading Little Women! I like it so far...I'll keep you posted! Thanks for posting reviews:) Consider me interested! I am currently reading The Other Boleyn Girl, which I've found to be a great and very interesting historical fiction read. Unfortunately, I made the mistake of seeing the movie first. Wish I hadn't because it would have been better to let the story unfold on the pages. Oh well. Recommend it nonetheless. I'm reading I, Elizabeth by Rosalind Miles. My flu-fogged brain is not too interested, so it is slow going for now. I just finished the Brief Wondrous Life of Oscar Wao, which is way outside what I normally read, but I really liked it. The author has a very lyrical style to his writing that kept me engaged. Nicole: I have I, Elizabeth in my to-read pile. I'll be interested to know what you think. Kim: I'm sooo glad you are enjoying Little Women. I remember taking it with me on our second flight to Russia and it kept me nicely distracted. You might like the book March by Geraldine Brooks as well. It's loosely based on the Alcott family.